“The reign of the middle-aged white man is over,” Claire Underwood (Robin Wright) intones over another very dramatic trailer for House of Cards’s final season—absent Kevin Spacey, whose character Frank Underwood was a decidedly bad president. Yes, this show is still on, but the great news is that it’s almost over. I personally stopped watching House of Cards after it got crazy enough for me to scream like a howler monkey at the television—roughly around the middle of the fourth season, when Claire was holed up in that crumbling manse with her mother and Frank was running for re-election. Will I watch the final season of this nightmare? Maybe! 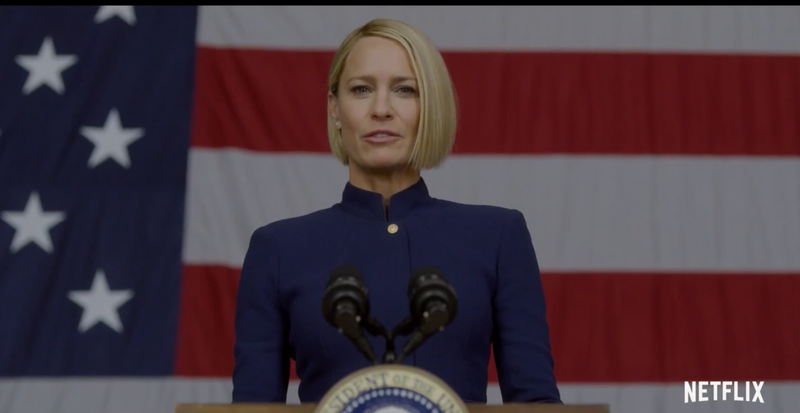 Claire Underwood has a sharp bob and is the president now, and all it took was for her husband to DIE to get a friggin’ woman in the White House. Please also peel your eyes for what looks to be an attempt at Claire’s life in and around the 51 second mark. Maybe the world will end, as I have prognosticated, when this show finally does. We can find out on November 2.